When Apollo astronauts brought back samples of moon rocks, scientists were surprised to find that some of them were magnetic. Scientists had no idea that the moon had ever had a magnetic field, and were at a loss to explain why it apparently once had one. A magnetic field is generated by what’s called a dynamo, which is caused by the fluid motion of a conducting material, such as liquid iron. In the case of the Earth’s magnetic field, this motion occurs in the planet’s outer core, and is caused by the convection of heat. But the moon isn’t large enough for convection to take place. Scientists were at a loss to explain what else might generate the required liquid motion of iron inside the moon, until now. Christina Dwyer of the University of California, Santa Cruz, and her colleagues suggest that the moon’s solid-rock middle layer, called its mantle, stirs up its liquid iron core. The researchers think this happens because the moon’s core and its mantle rotate around slightly different axes, and the boundary between them is not quite spherical, so their relative motion causes the fluid to mix around. The strength of this stirring is determined by the angle between the core and the mantle, and the distance between the Earth and the moon, because the tidal gravitational tug from the Earth causes the moon’s mantle to rotate differently than the core. 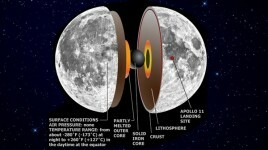 This model would explain why the moon used to have a magnetic field, but no longer does. That’s because the angle between the mantle and the core has narrowed over time, while the distance between the moon and the Earth has widened, causing the tidal forces to steadily decrease. While these forces used to be enough to generate a dynamo inside the moon, they aren’t anymore. Based on their calculations, the researchers estimate the lunar magnetic field might have lasted for about a billion years, somewhere between around 2.7 billion and 4.2 billion years ago. 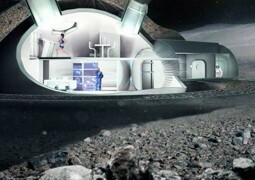 “The further out the moon moves, the slower the stirring, and at a certain point the lunar dynamo shuts off,” Dwyer said. Dwyer said her research team had studied the basic scenario, but hopes that scientists who specialize in modeling the complex physics of dynamos will now step in to investigate whether this could explain what happened on the moon. The researchers reported their theory in the Nov. 10 issue of the journal Nature.